"Two social outcasts survive in a techno-magical city"
The megacity of Throne has the highest mortality rates in all of Oeuvre. Neon-lit signs replace torches and gaslamps. Concrete monuments and soaring glass obelisks replace wizard’s towers and grand mansions. Bars and nightclubs replace taverns and inns. In the Third Age, Tekhnika Era 2077: 1st of Nymph, begins the story of two strange creatures bound together by luck and probability. Join them as they live in the world of Oeuvre during the time of technology, where steel spires loom overhead, neon lights blind eyes, Datascapes consume souls, and vices plague every spirit. Chrysanthemum just wants to know what happened to her all the years she was gone. A classic amnesia case, says Quinen. Memory gone, can only remember a past long gone. Her memories consist of the Late Second Age, where castles of stone and villages of wood thrived. Where heroes roamed the lands and kings ruled with the grace of Gods. That time is long gone. Magic is meshed with technology. Kings no longer rule. Quinen Argist is a dropout of the Collegium. He was an exemplary student, but his utter curiosity and will to never let a mystery go eventually merited him the moniker of warlock and an eviction from the Collegium. Quinen walks the bitumen roads of Throne City as a Private Detective, continuing his studies on his own and learning stranger, more esoteric magicks. Soon, he will unravel the mystery he has been so long been searching for. Join them as these two social outcasts survive this urban reverie, uncover secrets about themselves, and find that pretty things are worth fighting for. Urban Reverie has not been tagged yet. Help others find Urban Reverie by tagging it! 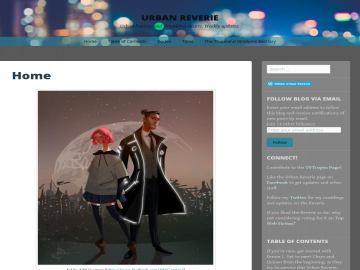 Urban Reverie has not been reviewed yet. Urban Reverie has not been recommended yet.